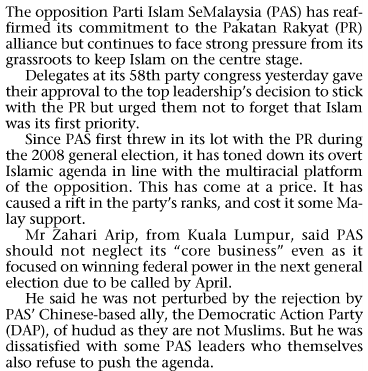 20 November 2012 Are members the backbone of PAS’ election campaigns? 29 November 2012 UMNO assembly before the election: Frightened to lose? 29 November 2012 Malaysia: “Islamist” as prime Minister? 2 December 2012 UMNO and BN only weak by infighting? Partyforumseasia: Efforts of the opposition coalition Pakatan Rakyat and the DAP to overcome the racial dividing lines in Malaysia’s party system have met with considerable difficulties. The Malay candidates in the “Chinese” DAP were not successful in the party elections but two were coopted into the CEC.